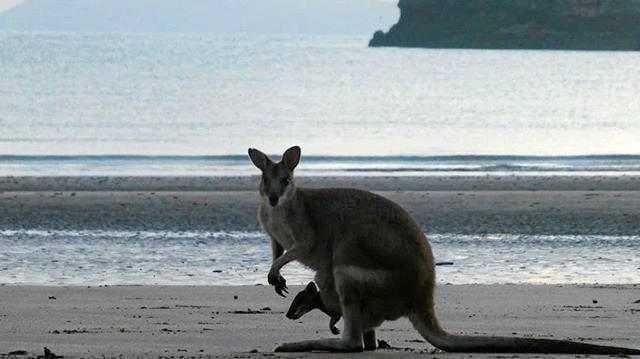 CHEEKY wallaby joeys have melted hearts at iconic Cape Hillsborough, after poking their heads out of mum's pouch for the first time on Monday morning, according to Mackay Tourism. The two new additions means there are four joeys in the wallaby mob down at the tourist hotspot. Joeys Molly and Charlie made their first appearances last month. Sam Tilden, Mackay Tourism's Sunrise with the Wallabies ranger, said spring time, coupled with school holidays, was a great time to meet the resident marsupials. "Cape Hillsborough is magical this time of year," she said. "New additions Charlie and Molly, along with resident kangaroos Bridget and Emmy-Lou love the attention and are as interested in us as we are in them." Mackay Tourism is offering half-price tickets for two weeks from Saturday in a bid to entice locals to the spot just as the baby wallabies are due to take their first hops. Cape Hillsborough Sunrise with the Wallabies Tours will be at the special price of $11 for adults, $7 for children and $30 for families. Daily tours commence 30 minutes before sunrise. Tours can be booked at www.sunrisewallabytours. com.